Gary Hudson, president and CEO of Farmers and Merchants Bank of Stuttgart, said the Federal Reserve Bank of St. Louis approved its application to buy the Bank of Fayetteville on Friday (Oct. 16). He said the approval from the state banking department also was received this week, giving the two parties the green light to close their cash deal. “Our plans are to move ahead quickly and try and close this deal by November 30. We will be drafting a letter to shareholders immediately,” Hudson told The City Wire on Friday. John Dominick of Fayetteville, a charter shareholder of the Bank of Fayetteville, said he has already received one letter from the Stuttgart bank regarding the offer. Dominick is a banking professor at the University of Arkansas and director of Fayetteville-based Signature Bank. He said the marriage between Farmers and Merchants and the Bank of Fayetteville is likely to a be good given the similar community-based ownership of each bank and like corporate cultures. Hudson said Farmer and Merchants sought out the Bank of Fayetteville and began talking in earnest early this year because of the similar community-bank cultures and corporate philosophies. “I knew John Lewis (founder of the Bank of Fayetteville) and liked him. Mary Beth Brooks took over the bank management from Lewis and grew its value while keeping the community-minded spirit. She’s done a remarkable job,” Hudson added. That said, Brooks has indicated she will step away from the bank as soon as the transfer is complete. Hudson said all of the Bank of Fayetteville employees have been offered jobs through at least June of next year. “We hope to keep the majority of this Fayetteville staff in place. There may be a few positions (10-15) or so that are eliminated, but there will be at least that many more new jobs created in the process of the consolidation,” Hudson said. He said the Bank of Fayetteville will keep its name. He said it’s crucial to keep as many of the local staff in place as possible to provide the stability customers expect. Also, Hudson pledges customers the same decision time on loan applications. “The Bank of Fayetteville will operate like a branch of Farmers and Merchants Bank. All federal reporting will be done on the same call report, but both banks will continue to support their respective communities,” Hudson said. He expects the transition to be a smooth with synergies already in place. Hudson said banks were already using the same loan review and loan compliance systems. The banks also have similar computer systems. He said each of the bank’s main branches were designed by the same company and their interior designs bear a resemblance to one another. “Our bank originated in 1945 and has grown by acquisition to add several other branches in the southeasterly part of the state. When we acquired Charter Bank of Perryville a few years ago that gave us a branch in Morrilton, which is the only branch we have located in an area of stable population. 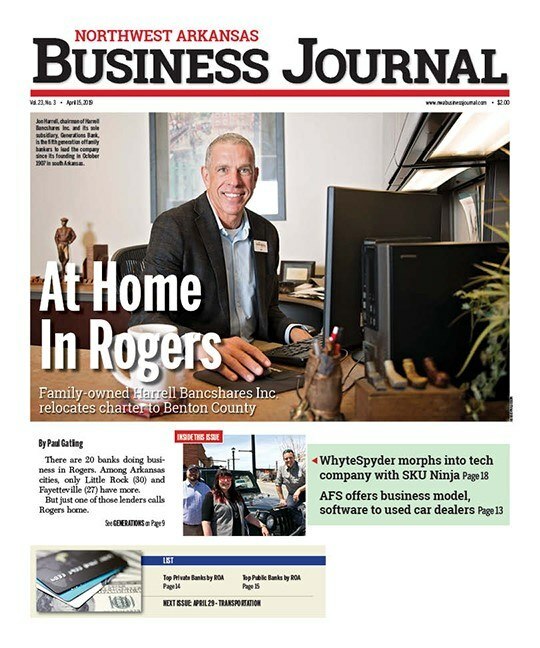 The consistent growth in Northwest Arkansas is what lured us to the region,” Hudson said. The Northwest Arkansas Council estimates that the local population is growing at a rate 25 people per day. That includes new births. That stat put the region over the 500,000 population mark earlier this year and is 2.5 times the growth rate of the rest of the country, according to Kathy Deck, director for the UA Center for Business and Economic Research. Aside from positive population growth the region’s employment expansion for last year ranked in the top 30 metro areas. Northwest Arkansas added 10,000 new jobs last year, a gain of 4.5%, Deck said. Hudson said the overall growth story in Northwest Arkansas is appealing to lenders in areas where agricultural loans are the main source of revenue. Hudson said Farmers and Merchants is proud of its agricultural heritage but is also eager to diversify its loan portfolio with new business in Benton and Washington counties. He is no stranger to Northwest Arkansas having received his law degree from the University of Arkansas Law School in Fayetteville. Several of the bank’s officers also went to college in Fayetteville and while it’s a different banking market than Stuttgart, Hudson said it’s still Arkansas. When asked about the competitive nature of the Northwest Arkansas market, Hudson said it’s like three popcorn stands lined up in row – they all sell popcorn, but their service can be differentiator. Dominick likes the growth prospects for Farmers and Merchants as they take over the ownership of the Bank of Fayetteville. He said Hudson runs a profitable bank and is getting a solid partner in the Bank of Fayetteville. At just $345 million in assets, Dominick said the Bank of Fayetteville is limited on the amount of loans it could make. Now, with the backing of Farmers and Merchants, the combined bank has assets over $1 billion and the ability to make larger loans. He said there is strength in numbers and Dominick expects more banks around the state will consolidate in the coming months to try and hit the $1 billion mark. “Aside from loan limits, the regulatory costs associated with Dodd Frank can be more easily absorbed by the larger banks who have more deposits to spread out the costs,” Dominick said. Just in 2015 alone, First National Bank of Paragould has acquired several vacant branches from Simmons First in Benton and Washington counties and is staffing them for full service in an effort to grow some marketshare in an already crowded space. Earlier this week, Citizens Bank of Batesville, announced plans to acquire Parkway Bank in Rogers and its branches in the southeastern part of the state for an undisclosed sum. Citizens Bank officials told The City Wire more than 18 months ago that the loan servicing office they were adding in Fayetteville at that time would become a branch and the bank had plans to expand further in this region. The primary reason they gave for coming to Northwest Arkansas was the consistent growth potential they could find here saying that the Batesville population is decreasing and if there were to grow, it would have be outside of their home base. “Northwest Arkansas is overbanked, but if you are a banker in Arkansas you want to be here,” Dominick said.